CTET Paper 1 Answer Key 2019 – The CTET Answer Key 2019 Paper 1 for all sets can be checked here. The answer key is released in PDF format after exam gets over on July 7, 2019, at 4:30 PM. Official answer key is published on ctet.nic.in in the form of pdf. In either case, candidates can download CTET 2019 Paper 1 Answer Key PDF from this page below. With the answer key, question paper is also published. Use both to calculate the score in the examination. CTET result is published within 6 weeks of conduct of exam. Get all details on CTET Paper 1 Answer Key 2019 from this page. CTET Paper 1 Answer Keys 2019 are published for all the sets. 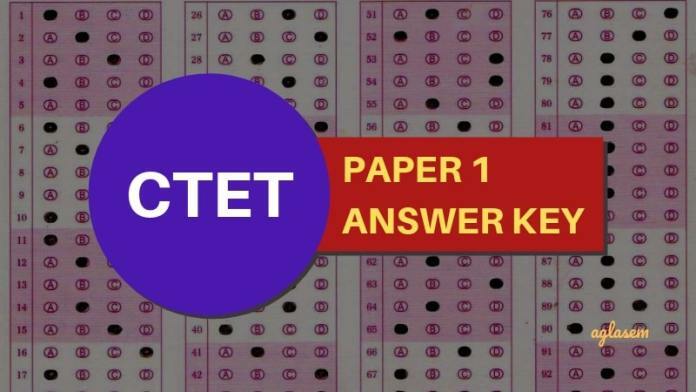 Answer key of CTET Jul 2019 Paper 1, contains all the correct answers to the questions asked in the exam. Answer Key of CTET 2019 Paper 1 will be updated here after exam. Paper 1 of Central Teacher Eligibility is for classes I-V teachers. Answer key of CTET 2019 Paper 1 for each set contains correct answers of all 150 questions. If candidates get 90 marks out of 150 in CTET Paper 1 as per answer key, then they have chances of qualifying exam (chances and not confirmed because answer key is final only when CBSE releases it after result). To be precise, there are total 150 questions in the CTET Paper 1. From each section, i.e. CDP, Language I, Language II, Mathematics and EVS, 30 questions each are asked. Candidates can go through CTET Paper 1 Question Paper 2019 while matching the answers to recall the question and the technique they used for solving. This way, candidates will also know how many questions are correct in the paper. Question Paper of CTET 2019 Paper 1 will be updated here after exam. How to Download CTET Official Paper 1 Answer Key 2019? Follow steps below to download CTET Paper 1 answer key from this page. Marking Scheme – 1 marks per question and no negative marking. In order to calculate the marks, the candidates will have to first match the answer in the key with that marked in the exam. Then, the candidates will have to add mark per correct question. Since, there is no negative marking in the exam the candidates needed not deduct marks for the incorrect response. When all the answers has been checked, the candidates will have to total and that will be the predicted score. Drawn through any Nationalized Bank, payable at Delhi. Candidates can use the OMR sheet to match the answers from the CTET Paper I answer key. With the help of these, candidates can evaluate their performance by calculate the estimate marks. We would again like to remind all the candidates that the answer key of CTET July 2019 Paper 1, released immediately after exam, is unofficial. This means that the answers were compiled by the education experts and the coaching centers. Hence, please use your best judgement and then use the unofficial CTET Paper 1 Answer Keys. Also, the unofficial CBSE CTET Answer Keys may be different from the CTET unofficial Paper 1 answer key. The official answer key of CTET Paper 1 for all the sets and subjects is given below. Click Here to open CTET Answer Key for Paper 1 in a new tab. Set I Click here for CTET Paper 1 Answer key – Key published for all subjects! Set J Click here for CTET Paper 1 Answer key – Key published for all subjects! Set K Click here for CTET Paper 1 Answer key – Key published for all subjects! Set L Click here for CTET Paper 1 Answer key – Key published for all subjects! If you have any queries regarding CTET 2019 Paper 1 Answer Key for any Set, please ask in comments below.